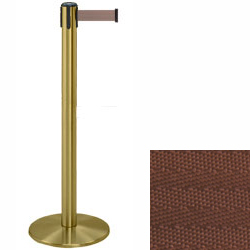 These brass stanchions with brown belt are made of durable metal and have a floor standing design. 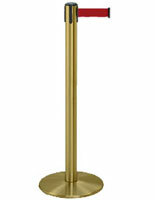 The fixtures feature a 4-way adapter for connecting to other stands, making them great for bars, restaurants, hotels and banks. Each of the brass stanchions comes with a 7.5' long retractable band in a neutral color that goes with any environment. 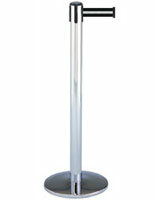 While the metal posts weigh only 24 lbs, they feature a weighted base for stability in any airport or bar. 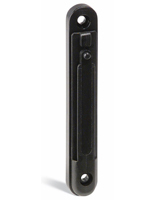 The floor standing stanchions are part of the Tensabarrier line and will accommodate accessories in the series. 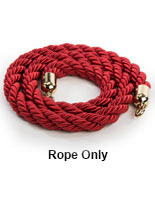 The fixtures are also available with other metallic finishes and band colors.